Today we have some great advice that suggests that to flirt online when doing online dating is the most important way for a man to communicate with a woman. Whether this advice on how to flirt online is THE advice you should follow is up to you of course. I would say that whether you should mainly flirt when online dating would depend to some extent at least on the kind of person you are communicating with, not to mention the kind of person you are. So you had better try to get some kind of a feeling for what kind of person you are talking to online before you start turning on the flirting. Anyway, whatever your view on how to flirt online dating style or styles, the flirting advice below makes interesting reading. The advice is below but first here are a few related pages for more reading about online flirting. How to Flirt With a Single Woman looks at two important tactics men can use when flirting online or offline. Taking the reverse approach, so to speak, Flirting Tips for Women covers 9 flirting techniques than women can make use of when flirting with men. Finally Attraction Signs – How to know if someone likes you is well worth checking out as if you can see that someone likes you then this of course paves the way for you to flirt with her or him. To begin with you want to make meeting women fun. It is fun, isn’t it? You do want to have fun, don’t you? So, if you are approaching women and then engaging them in long boring descriptions of your favorite topic then you are probably boring them and sending them to sleep! Single women, to some extent at least, will expect you to flirt. They will expect you to smile and say witty or amusing things. In a nutshell they will expect you to show interest in them. Boring them about politics or how to change a faucet washer is simply not showing interest in them. They will make an excuse and move on at the first opportunity. So, in more detail, how do you communicate with a woman to show you are interested in her? You can gently tease her, even make jokes (but not at her expense!) If she is with other people you can give her extra attention to show that you think she is special. Make eye contact with her for most of the time you are talking to her, compliment her on her clothes or jewelery. Ask her about herself, touch her arm when you are explaining something… Most of all relax and don’t be too rational about the whole thing. Enjoy flirting with her. Okay, that’s how to flirt face-to-face, but how do you flirt with a girl online? What sort of things should you talk about? Some topics naturally lend themselves to flirting. Examples are funny things you have done, other people’s relationships, celebrities and TV gossip, what other people are doing and why it is funny. Place your focus upon jokes and some gentle teasing – this works well online. Don’t compliment her too soon online, for the situation is different from flirting with her face-to-face. Online you need more time to get to know her, to see pictures of her, to find out what she’s like. So compliment her too soon online and you could appear desperate. Also, don’t get too sexual in what you say. This would be a turn-off for most women online and goes beyond just flirting. Flirting is a subtle business sometimes but it isn’t difficult to master and with a little practice you can become great at it! Copyright (c) SingleDating.com – all rights reserved – may not be used elsewhere. Please now check the address bar of your browser — if you aren’t viewing this how to flirt online page at http://www.singledating.com/blog/ then you must be reading an unauthorized copy as this content is exclusive to SingleDating.com and not published anywhere else. It is copyright (yes, I know, but they will even copy this bit too!) 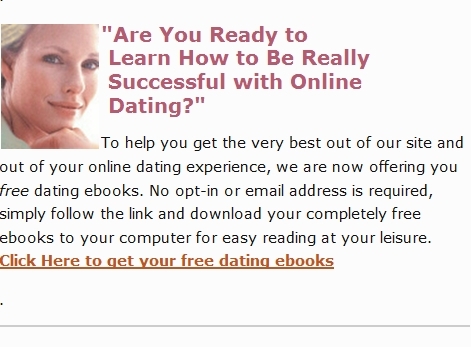 Please go directly to www.SingleDating.com/blog now for the real page with our genuine recommended links. Don’t forget to bookmark this ‘how to flirt, online dating style’ page! Flirting is fun because it not only fulfills some of your instinctual needs to interact with others, but it also demonstrates to others your degree of interest in them. Likewise, the response to your flirtation indicates the degree of interest in you.